After seven weeks in England – the longest trip back since I came to Italy – it was good to come home. Even the relentless heat, which clung to our skin as we walked down the plane steps and has refused to let go ever since, hasn’t dented my relief at being back in Testaccio. Relief though, is one thing, settling back another. I have felt a bit like a snow-globe in the hands of a hyper-active toddler, thoughts about time away, work, writing a book, promoting a book, family, home in England which isn’t home anymore, and home in Rome, a city in profound crisis, all swirling around. Swirling which trips into surreal during restless nights in our small, hot flat, the droning urumm urumm urumm of the knackered floor fan offering a soundtrack to my anxious half-sleep. Of course everything with settle, eventually, somethings different, some the same. If I have felt like a snow-globe, then writing here has felt trying to jump on a moving roundabout as a child. Wanting to, lurching forward, only to watch the handle rush past, Whoosh. The book launch dinner made by some of my favorite cooks in one of my favourite places, I tried to write about that. Whoosh. There was the trip within the trip to Sicily for the food writing course, from which I returned inspired and overwhelmed in equal measure, surely I would write about that? Whoosh. I’d write about cooking with my sister, one of the nicest things about my time in England, hours and hours spent in her kitchen, kids running riot in the garden, the two of us talking and drinking wine and talking as if to make up for lost time (which we were). Whoosh. I’d write a book review or something more sophisticated than a snow-shaker metaphor. Or maybe I wouldn’t, not yet at least. For now, in order to jump on, I will write about lunch. Turn on the radio. Fill a big pan with water, light hob, plonk pan on the stove. Stop, first move the coffee stand from the hob and burn fingers, and then put the pan on the hob. Pull milled tomatoes from the fridge and wonder where the hell the water under the fridge is coming from. Cut aubergine into cubes, don’t worry about being too precise, no-one is watching and don’t bother salting unless you want to. Fry the aubergine in lots of extra virgin olive oil until tender and golden and sweat steams down the nape of your neck (it is 38° even without the boiling oil). Use a slotted spoon to lift the cubes into kitchen towel. Cooking can be lots of things, today it is a task, but a welcome one. Is the pasta water boiling? Yes, add salt, plenty, stir and throw in the pasta and stir again. Add garlic to the aubergine pan, then the tomatoes and cook until saucy (I like saucy, and find it a better note than specific timings), return aubergine to the pan and cook a minute longer. Add lots of torn basil (inhale deeply) and the drained pasta. Toss properly. Finish each plate with lots of ricotta salata. Simple, generous and richly flavoured: this is the sort of food I like to eat. 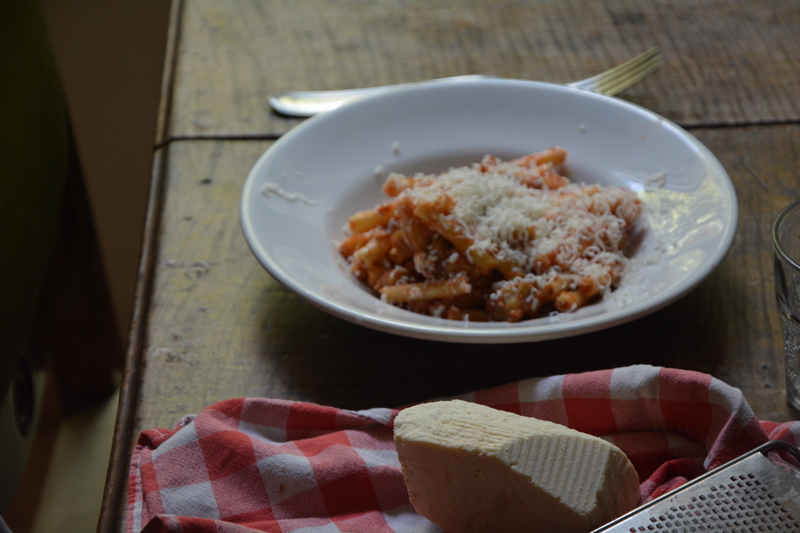 I am not going to call this pasta alla norma, a dish typical to Catania in Sicily. It is however very much inspired by it: short pasta mixed with fried aubergine, tomatoes, lots of fresh basil and topped with Ricotta salata. It is important that you use good extra virgin olive oil, and don’t skimp on the quantity, the pleasure is in the taste of properly fried aubergine, rich and plump, softened and sharpened by tomatoes, lifted by the fragrant basil and finished with the soft, salty-sharp ricotta. If you can’t find ricotta, parmesan or pecorino work well too. It’s good to be back. More soon. Pasta with aubergine, tomato, basil and salted ricotta. Cut the spiky cap from the aubergine and then cut into 1cm square cubes. Cover the bottom of a frying pan with 1 cm of olive oil and warm over a medium/high flame. Once the oil is quite hot, add a single layer of aubergine and fry until tender and golden, then remove with a slotted spoon onto kitchen towel. Continue frying the aubergine in batches until it is all done. You should still have some olive oil in the pan, if not add some more (you want about 4 tablespoons). Once the olive oil has cooled significantly, add the peeled garlic and fry until lightly gold and fragrant – do not let it burn or it will be bitter. Add the tomatoes and cook, stirring often and pressing gently with the back of a wood spoon, until thick and saucy but not dry. Add salt to taste. Add the aubergine to the tomato, cook for another minute or so, then pull from the heat and add a handful of fresh torn basil leaves. Meanwhile bring a large pan of water to the boil. Once the water is boiling, add salt, stir and then add the pasta and cook until al dente. Drain the pasta and add to the sauce and stir. Divide between plates, top with plenty of grated salted ricotta and serve. 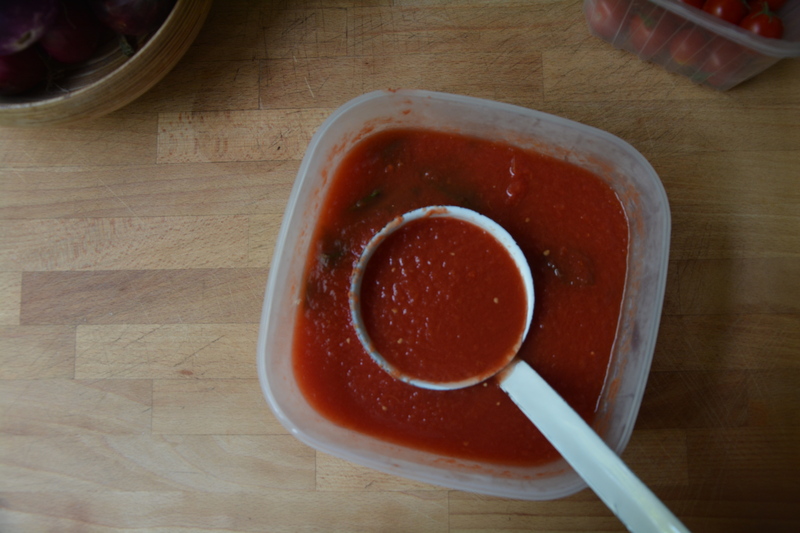 As many of you know, I have been happily contributing to the Guardian Cook Batch Cooking series and the latest one is all about tomato sauce. I want to bring the warm and generous words about Five Quarters that have been written on personal blogs together in one place, here. Thank you so much Emiko Dan, Evie, Kath, Simon, India Knight, Margaret, Gemma, Molly, and the inimitable and wonderful Gareth Jones who very sadly passed away earlier this month and is missed terribly. I needed to read this today! I’ve been trying to make sense of my own whirlwind. Trying to work out how to enjoy it rather than watching it whoosh past. Lovely recipe. ….a good reminder to embrace simplicity. Your description of the heat clinging to your skin is very, very accurate… I feel like it’s clung on and it’s still hanging on and hasn’t let go for weeks now. I’m surprised you manage to actually still cook (and eat!) hot food lately – I’ve been subsisting on a series of increasingly sad, desperate salads. This recipe makes me want to get back into the kitchen in a serious way though – I adore pasta with eggplant. We see your travels through your writing, whatever you send us is incredibly heartwarming and interesting. It is truly the best time of your life, enjoy it as it whooses by, we certainly enjoy your retelling of your experiences! When we were little my mother always had a garden with lots of eggplant. If we didn’t all manage to sneak off with the just fried and salted eggplant slices while my mother’s back was turned, we would have this for lunch. (Only with pecorino instead of the ricotta salata). Your writing is always so evocative and lovely. Hope that you guys cool down a little soon. This is so weird and more than a little spooky, as just last night I was searching for a decent norma recipe. Two days ago I stumbled upon a superb (and previously undiscovered) Italian deli on the Fulham Road where I could stock up on ricotta salata and guanciale. As the nice man in the shop said, now you don’t need to travel to Roma any more. (ah, well… ) My stash is sitting in the fridge while I’ve been fidgetting with hungry anticipation. Alla norma tonight and alla gricia tomorrow! Hurrah! Well, I’ll bet you wish you were INSIDE that snow-globe. Am grateful you’ve missed most of July as it’s been rather wretched. And I’m speaking as one who does not have to deal with a very active toddler or any of the many other things on your plate (literally and figuratively). The heat has made it difficult to focus on anything and being away from “home” makes it very difficult to focus on “homework”. So glad to have you back here, though at least now we have your book which is delightful and full of glorious photos to pore over and brilliant writing to cherish to “fill in the gaps”. Today’s recipe is very inviting. Fingers crossed for the water under the fridge, though I am convinced our machines feel the heat just as we do. Coraggio e complimenti! this dish sounds fantastic. i also want to say- got your book, read it cover to cover and thought it was honestly one of the best cookbooks i’ve ever read. really. your writing is just lovely, the object itself is pleasing to hold, and- oh- have cooked a few recipes from it, too, and they do not disappoint. Just wanted to say that I recently discovered your blog and am about to order your book. I really enjoy reading your posts and as an Australian of mixed Sicilian/Calabrese origin, I particularly like your Sicilian recipes. Your description of home not quite being home anymore struck a cord too. I’ve been in Turin since 2007 and the last time I was back in Australia, I actually found myself itching to get back to Turin after an extended stay of 4 months. Looking forward to reading your new book! What a whirlwind!? sounds fun though 🙂 … also can’t wait to start cooking from your book! Hi Rachel, I clicked on your latest post earlier in the week and it’s been sitting there waiting for me to get a few minutes quiet to read it. Well worth the read, as always. Thanks for the mention, by the way – took me by surprise! Just back from Leila’s with armfuls of pasta Ternetta. She’s doing well out of me since your book came out! I’m glad you’re back Rachel. Your words are always a breath of fresh air, even when the subject is just lunch (as you say). I read Gareth Jone’s note on your book, it was lovely. I’m so sorry about the passing of your friend. anyway, I hope you settle back into your routine soon, and that your thoughts calm down as you do. Sending much love and hopefully some respite from the heat in Rome. btw, i just realized that it is exactly one year since I visited Rome…and still think it was such a pity we couldn’t meet up the last time. Next time I’m there, we will. Ahhhh.. I’m salivating in need of this pasta. Yum. Hi Rachel, I just started reading your blog today. There are so many lovely things here that I didn’t know where to start. This pasta dish reminds me of when I was in Rome around three years ago. Around half way into my trip and after indulging my love of pizza and gelato, I didn’t feel too good. I didn’t feel like having any dinner but the owner of the trattoria we visited made me a small plate of homemade pasta with the simplest tomato sauce ever. I just couldn’t believe how much better I felt after eating that. I’m still surprised to this day. The quality of real Italian food is amazing and I now understand all those who say that you must go to Italy and taste their food to know how good everything is. Apologies for my rambling but your recipe instantly reminded me of this! Have a great day! Hello Rachel, first time commenting but long time reader. Love the way you write, so calm. Will try this recipe soon because I have a few aubergines in my garden. They are very small, slightly larger than an egg but very tasty. I need to go buy aubergines this sounds wonderful i need to cook it instantly! Was excited to see your book mentioned in recent (last month?) Waitrose magazine, with warm words of praise! I got your book too and I love it! I absolutely refuse to turn on the cooker in this heat though but I am looking forward to trying out some recipes in September. 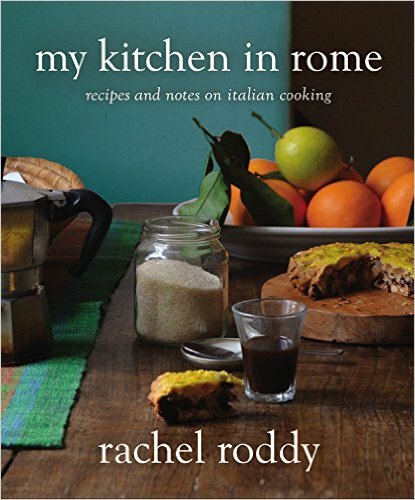 Hi Rachel – this is Alex from Testaccio (well, London really, but you know what I mean)…Just wanted to say that I bought your book for myself as a birthday present, and I love it. It’s beautifully written and just flicking through it is making me ravenous. I’m back in London for the summer, and I can’t wait to get back to Rome for some proper coffee and cacio e pepe. Also, while the book has special significance for me, knowing you and Testaccio, I’ll definitely be recommending it to friends. Hope you’re well and enjoying your summer. I’m sure we’ll bump into each other again once I’m back in September! Looks amazing! I’ve been getting eggplant in my CSA boxes this summer. Can’t wait to try this! I am DEFINETLEY gonna try this! This IS PERFECT FOR ME as I LOVE PASTA! Great RECIPE! I LOVE PASTA! 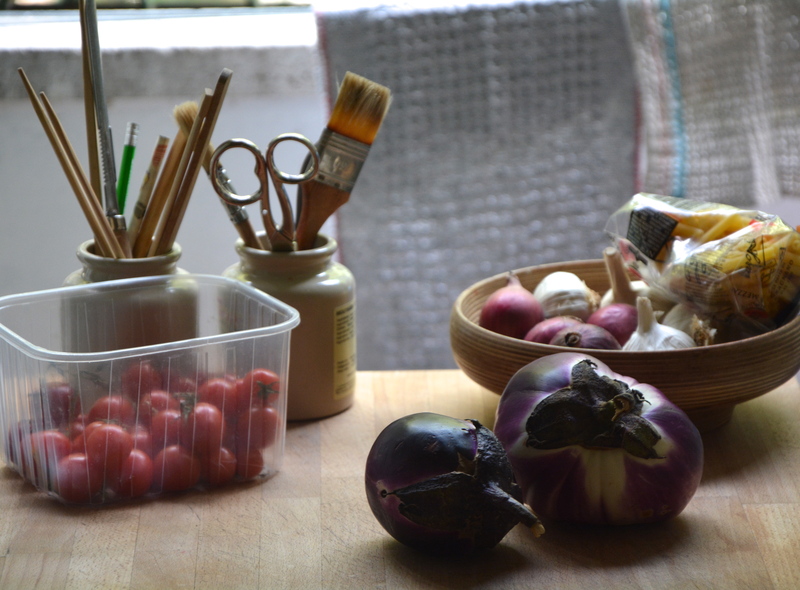 Wonderfully simple food ….the sort of food that I like to cook. So good to find such a beautifully written blog. This pasta looks amazing. Nothing quite like simple, classic pizza in Italy. 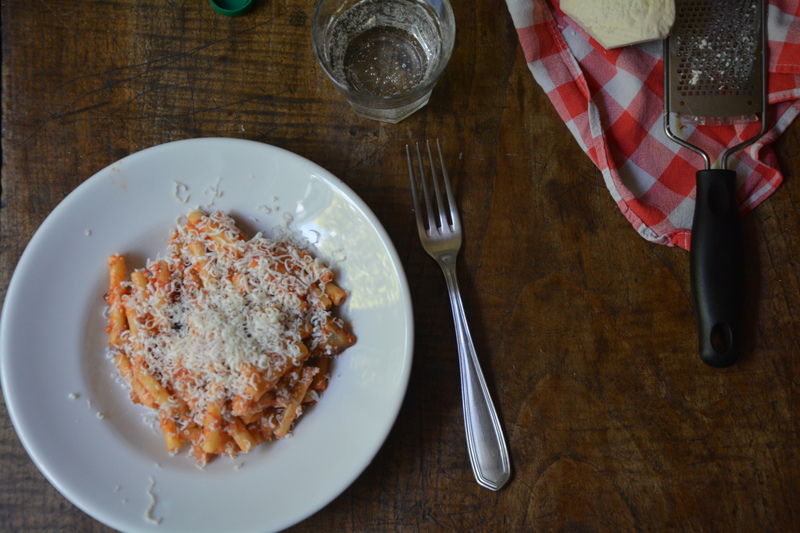 I found the best every penne and ragu while I was living in Florence and have been trying to recreate it ever since… Maybe I need to come back to Italy. Might do the trick! This might be my favorite pasta with eggplant recipe ever! We have been longing for something like this since visiting a wonderful trattoria close to to Teatro Massimo in Palermo last year. Love your blog and looking forward to your book! hello rachel .i love your blog very much. you inspiring me .. keep posting for the recipe. i hope we can sharing about our traditional food. btw im from indonesia. This might be one of my favourite meals ever. I made it several times so far but if it were up to me, I’d eat it every other day!